Situated on six beautiful acres in the charming seaside village of Guysborough. 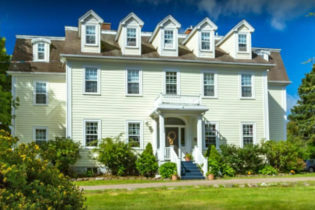 Your luxury inn by the sea for a Nova Scotia getaway on Marine Drive. Your Nova Scotia getaway on Marine Drive. On six beautiful acres in the charming seaside village of Guysborough you’ll find your luxury inn by the sea. Described by Travel Lady Magazine as the “crowning jewel of a fabulous trip” to Nova Scotia, DesBarres Manor blends the elegance of the past with modern luxury. Located in the charming seaside village of Guysborough on scenic Marine Drive, the Manor provides exceptional accommodations and dining. Our 1837 manor home has been meticulously restored to its original grandeur with elegant common spaces, beautiful rooms, original art, fine antiques and warm, attentive service. Enjoy our six acres of landscaped grounds from our grand deck and gazebo. From the spectacular open kitchen, our Chef prepares contemporary Canadian cuisine with an East Coast flair. Chronicle Herald features writer Bill Spurr described his meal at the Manor as “one of the most delicious things I’ve ever eaten”. The Manor’s romantic fireside dining room provides an intimate and relaxed atmosphere and your dining experience is complemented by the Proprietor’s extensive wine collection.